MEDALLA MILITAR USA. MUJERES PARTICIPANTES EN EL DESEMBARCO DE NORMANDÍA IIWW. PRECINTADA. EXACTAMENTE EL LOTE DE LA FOTO. DIMENSIONES EN LA FOTO. MEDALLA PRECINTADA, PERFECTO ESTADO. EMITIDA DE ACUERDOS A LAS DIRECTRICES DEL GOBIERNO ESTADOUNIDENSE. The Women’s Army Corps Service Medal is a decoration of the United States Army which was created in 1943 by order of President Franklin Roosevelt. The decoration was intended to recognize the contribution of women to the United States military during the Second World War. 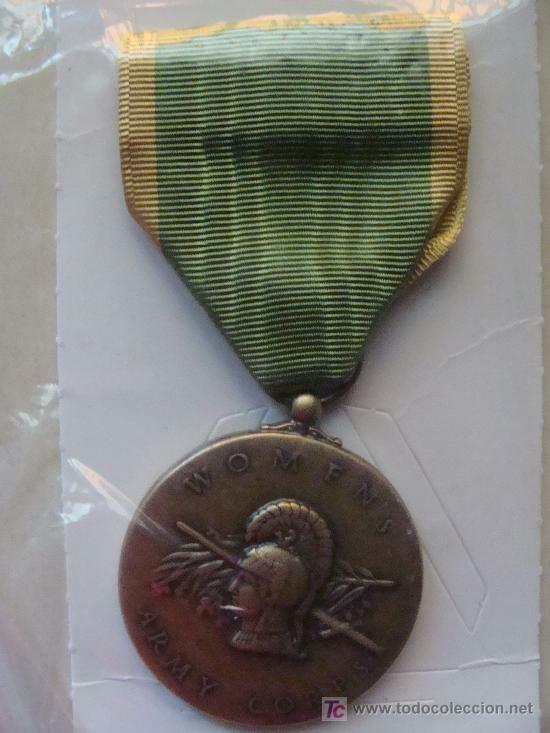 The Women’s Army Corps Service Medal is awarded to any service member who was a member of the Women's Army Auxiliary Corps between July 10, 1942, and August 31, 1943 or the Women's Army Corps between September l, 1943, and September 2, 1945. The medal is issued as a one time decoration and there are no devices authorized for additional presentations. The Women’s Army Corps Service Medal is considered obsolete since, in the modern age, the 21st century United States military is a combined service and no longer maintains separate service corps for women. MEDALLA MILITAR USA. SERVICIO HUMANITARIO USA. HUMANITARIAN SERVICE. PRECINTADA. MEDALLA MILITAR USA. SERVICIO MILITAR EN EL ÁRTICO. ARTIC SERVICE. PRECINTADA. MEDALLA DEL CUERPO FEMENINO DEL EJÉRCITO, 1942-43. MEDALLA MASONICA INGLESA DE PLATA MACIZA Y ESMALTES DE 1953.EXTRAORDINARIO ESTADO DE CONSERVACION. Offizielle Uhrzeit TC: 07:58:18 TR: 103 ms.